While Republican presidential nominee Donald Trump is going off on paranoid rants about how the media and inner-city voters are trying to steal the election from him, his on-and-off supporter Senator John McCain has already moved on to the larger picture. Today, he pledged to ignore the result of the election if Hillary Clinton wins. The country is already in an open constitutional crisis because the Senate has refused to consider President Obama’s nomination of Merrick Garland to the currently empty seat on the Supreme Court. For seven months, the Republican majority in the Senate has chosen to interpret the “advice and consent” clause of the Constitution to give it the right to deny the sitting president the opportunity to even have a hearing on a Court appointment. Stuck with an even number of justices, thanks to the still-empty seat on the court, the Supreme Court has been split 4-4 and unable to render decisions in closely disputed cases, giving lower courts the final word. Two justices have recused themselves from pending lawsuits about prisoners detained after 9/11, which would leave the cases to be heard by six justices, the legal minimum. The original excuse for the Senate’s obstruction was that when Justice Antonin Scalia died this past February, with more than 11 months remaining in Obama’s second term, it was too close to the next presidential election for the previously elected president to exercise his power. More important than filling the seat promptly, the argument went, was allowing the American public to have a voice in how that seat would be filled. There is a glib line of argument that says that the Senate’s refusal to seat a new justice is no big deal, because it follows the strict terms of the Constitution: The president may not appoint a new member to the Supreme Court without the Senate’s approval, after all. And what is the Senate doing but taking its power to approve appointments seriously? 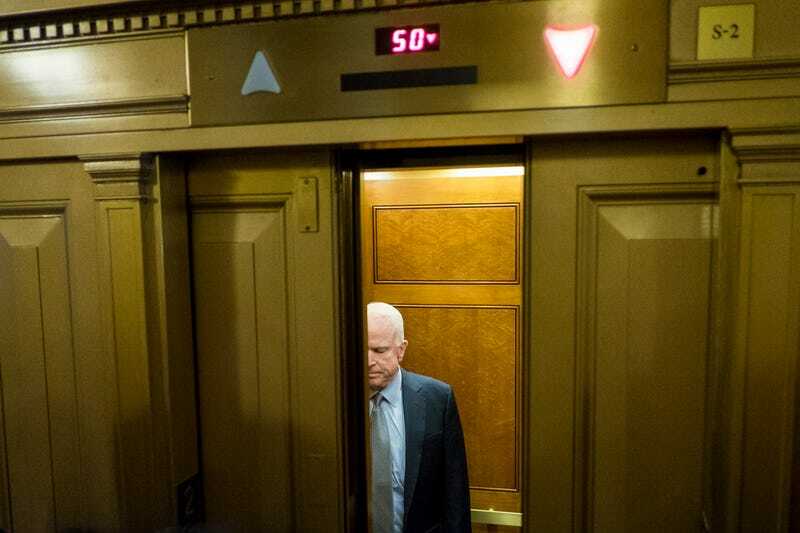 McCain’s promise, though, makes the Senate’s unprecedented overreaching explicit. It’s a pledge to oppose “any Supreme Court nominee”—not a vow to reject Merrick Garland or some other person, but a vow to reject the new president’s authority to make a nomination at all. A predetermined “No” is not advice or consent; it’s a power grab. It’s a promise to the party’s base that, even if Donald Trump is defeated, Republicans won’t participate in the governing of the country, and will do what they can to keep it from being governed. If 11 months wasn’t long enough to wait, they’ll try four years and 11 months. As long as the voters won’t choose the Republicans’ presidential candidate, the Republicans won’t recognize the presidency.